Prunus virginiana – Choke cherry sticks were used by Aboriginal Peoples for roasting game. The wood did not burn easily and the added spice to the meat. Prunus is from the Greek “prounos”, and ancient name for the plum tree. The species name virginiana means “of Virginia”. The common name, choke cherry, was given because of the bitter and astringent taste of the berries. Bush or small tree, 2 m to 5 m tall, and the trunk up to 4 cm wide. Leaves: Leaves of choke cherry are dark green above and lighter underneath, 2.5 cm to 7.5 cm long, egg-shaped or broadly oval with a pointed end, and have sharply-toothed edges. Their shape — widest above the middle of the leaf with a short pointed tip — distinguishes the plant from pin cherry, whose leaves are widest below the middle and taper gradually to a point. Flowers: Flowers are white, each 1 cm to 1.5 cm across, and hang in dense popsicle-shaped clusters up to 15 cm long (about 35 flowers). Each flower has 5 petals. Fruit: Berries are red, ripening to bluish black, less than 1 cm in diameter, and have a fairly large stone. The fruit hangs off the branches in a long, drooping cluster of 6-12 berries. The bark of the choke cherry tree is grey-brown or reddish. Bruised twigs give off a bitter odor of almonds. 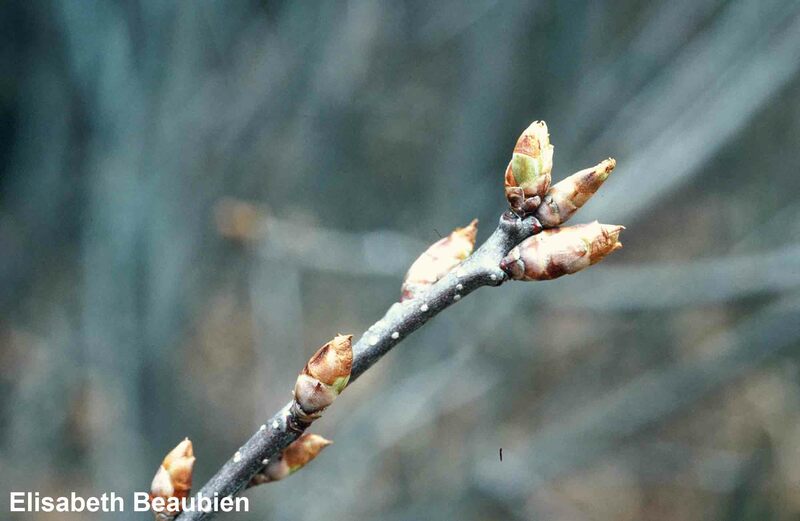 This is the only member of the genus without a grayish coating that wears off.Choke cherry buds (in winter) are sharply pointed and 3 to 4 mm long. The bud scales are dark brown with pale edges. 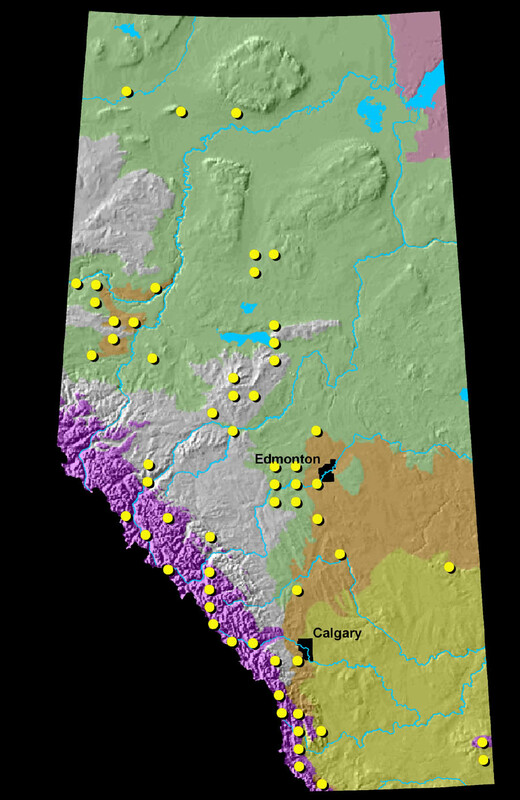 Widespread throughout Alberta where there is enough moisture for the shrubs to grow. 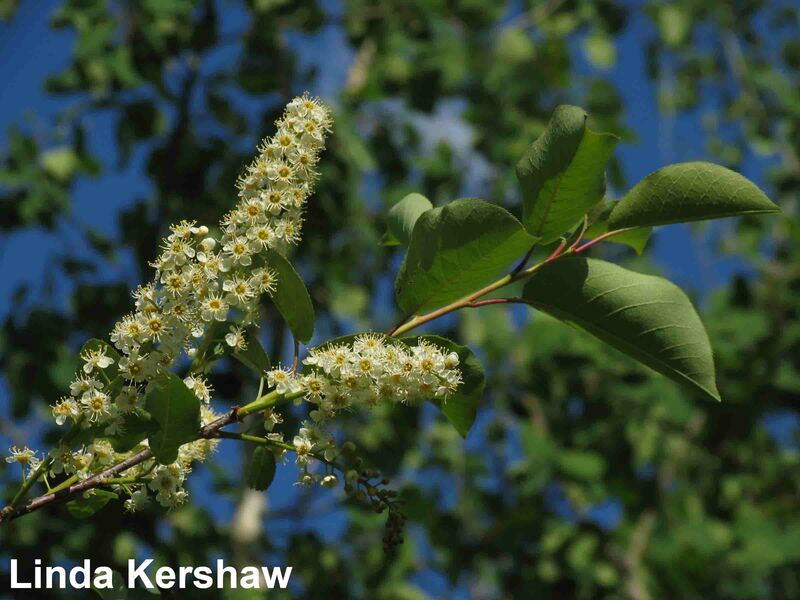 Choke cherry grows in aspen groves, ravines, sand hills, rocky and open woodlands, and the edges of creeks. 1. Tag a shrub for observation. First bloom: When the first flowers are completely opened in at least 3 different places on the observed shrub. Mid bloom: When half (50%) of the flowers on the shrub under observation are open. When does this shrub bloom? Flowers late May to early June. In well-lighted openings and clearings of forests, choke cherry can out-compete shade-loving plants. 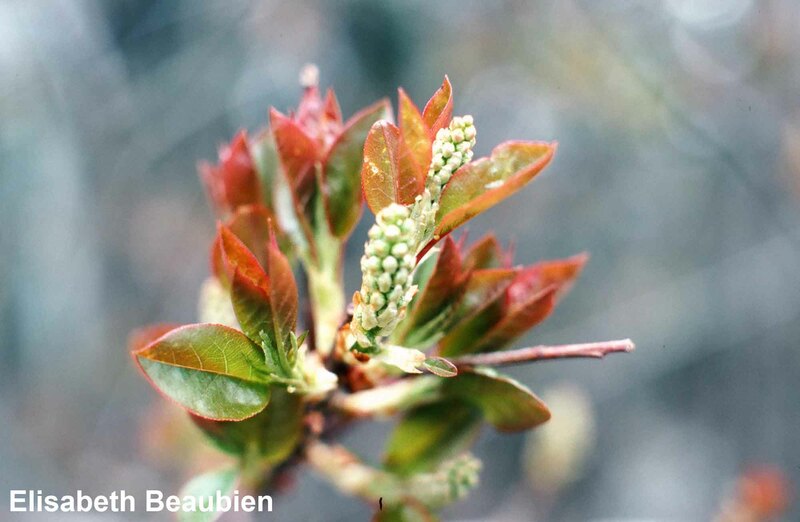 Choke cherry can dominate during secondary succession started by logging, fire, or wind throw, and is well adapted to disturbance by fire, recovering relatively rapidly after being burned. Sprouts can develop from the root crown of choke cherry stumps and dying bushes, when light increases after opening of the forest canopy. By continuously producing new sprouts, choke cherry can dominate a site for a prolonged period of time. 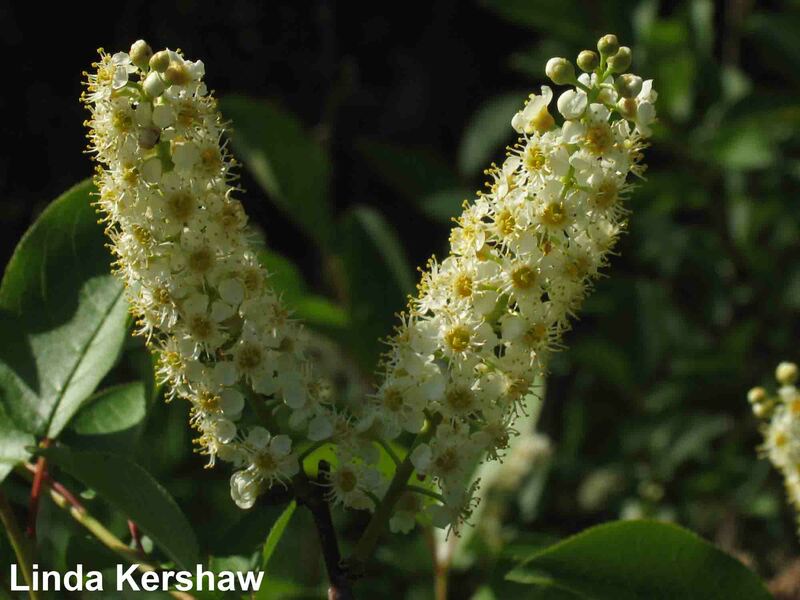 The choke cherry shrub is conspicuous in the spring when the white flowers cover the entire tree. In the fall, it is especially showy when its branches are bent down by the weight of the black, juicy berries. Although most people find the berries too bitter, songbirds and mammals relish them. Deer, elk, and moose eat the leaves and twigs of the shrub. Not only is the choke cherry an excellent food source for wildlife, but it also provides habitat for birds. When a large grove of choke cherries grow together, they can provide habitat for larger mammals. Choke cherry is sometimes used by white-tailed deer for antler rubs, although preference is for trees with at least a 5 cm trunk diameter. The choke cherry flowers in late May to early June and thickets seem to come alive with the buzzing sound of eager, pollinating insects. Berries ripen in August. Warning! Be sure to remove the stones if you are eating choke cherries. Children have perished by eating the berries, stones and all. Except for the flesh of the fruit, every part of the plant contains poisonous hydrocyanic acid. The acid is destroyed when the berries are cooked or dried. Eaten fresh or cooked, choke cherries are easy to gather and convenient. A traditional First Nation’s method of preparing the berries was to crush them between two stones and then warm them up in a pan with lard and sugar. Crushed and dried, the berries were also used with pemmican in cakes or cooked in stews. Choke cherry sticks were used by Plains Indians to roast game. The wood did not burn easily and added spice to the meat. Twigs were also used to make pins for teepees, and cross sticks for the wind flaps at the top of the teepees. They also made skewers, arrows, bows, tamp sticks, back rests, paint applicators, pipe stems, tent pegs, digging sticks, medicine pipe tripods, toothpicks, and bow drills for starting fires. Today choke cherries are still used to make excellent jelly, pancake syrup, and wine. The crushed fruit can also be frozen for later use. There is a long history of choke cherries being used medicinally, including a tea made from the leaves, stems, bark and roots that was used to treat colds, fevers, and pneumonia. The tea was also given to clear the throats of singers and speakers or to relieve high blood pressure and heart problems. Other choke cherry teas are used to treat diarrhea and other stomach problems or to expel worms. 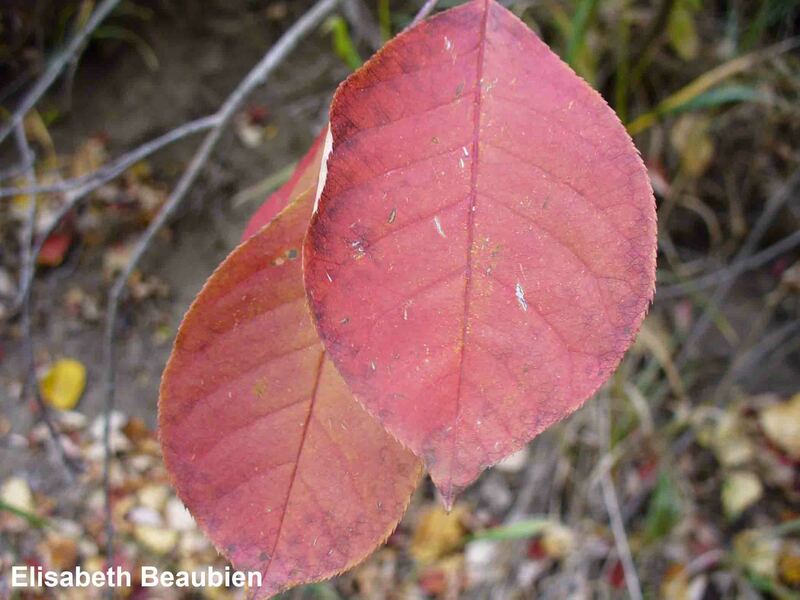 Since the 1800’s choke cherry bark has been used to make cough syrup and drops. Place cherries and water in a large saucepan, bring to a boil, mash, and simmer 10 minutes. Strain off juice through a fine sieve or jelly bag. Measure and place in a large crock or wine keg, add 750 g sugar per 1 L juice, mix, and cool to lukewarm. Add yeast and raisings (optional), mix well, cover, and ferment for 5 days or until bubbling has ceased. Stir well and add brandy if desired. Keep covered for about 3 months, then filter and bottle. After a few days, cork tightly and store in a dark, cold place for 6 months before using. Stem, but do not pit the choke cherries, and place in a large saucepan with water. Mash and simmer, covered for 10 minutes. Strain through a jelly bag and measure the juice. Place 425 ml (1 ½ cups) juice back in saucepan, add apple juice and lemon juice, and mix in pectin crystals. Place over high heat, stirring constantly, until mixture comes to a boil. Stir in sugar. Bring to a boil again and boil hard for 1 minute, stirring continuously. Then remove from heat, skim, and pour into hot, sterilized jars and seal. Store in a cool place. Makes about 10-12 medium sized jelly jars. 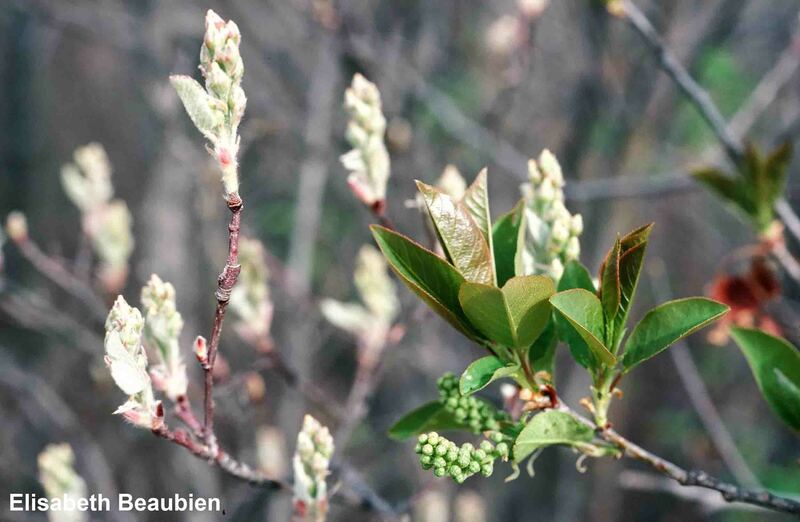 Choke cherry shrubs are frequently planted for their attractive spring flowers and to attract birds and other wildlife to a yard. Although choke cherries do have some disease and insect problems, they are a popular choice in landscaping because of their drought resistance. Choke cherries do best in a sunny location with rich soil. “Great numbers of Indians of all descriptions Came to the fort many of them bringing corn to trade, the little Crow, loaded his wife & Sun with corn for us, She made a kittle of boiled Cimmins, beens, Corn & Choke Cherries with the Stones, which was palatable This Desch is Considered, as a treat among those people” (captain William Clark of the Lewis and Clark expedition, reporting on the Mandan whose village [in present-day North Dakota] was near the fort built by the expedition party, December 23, 1840). Johnson, D. et. Al. 1995. Plants of the Western Boreal Forest and Aspen Parkland. Lone Pine Publishing. Edmonton, Alberta. Kershaw, L. 2000. Edible and medicinal plants of the Rockies. Lone Pine Publishing. Edmonton, Alberta. Kindscher, K. 1992. Medicinal Wild Plants of the Prairie: An Ethnobotanical Guide. University Press of Kansas. Lawrence, Kansas. Royer, F. and R. Dickson. 1996. Wildflowers of Edmonton and Central Alberta. University of Alberta Press. Edmonton, Alberta. Scotter, George W., H. Flygare. 1986. Wildflowers of the Canadian Rockies. Hurtig Publishers Ltd. Edmonton, Alberta. Turner, N. and A. Szczawinski. 1988. Edible Wild Fruits and Nuts of Canada. Fitzhenry and Whiteside. Markham, Ontario.